Several updates have refreshed a downtown parking garage. 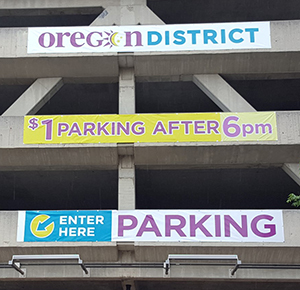 The Oregon District Garage, which has 1,416 spaces, has switched its rate structure, reducing the fee to just $1 after 6 p.m. New banners and lighting also enhance the experience, along with an interactive mural scheduled to be applied this summer. The location makes it the perfect parking area for people visiting the Oregon District and/or the new Levitt Pavilion. Use the EasyPark guide on our website to locate more garages and lots.